There had been rumors in the wind and shadows shifting in the dark. Tales of creatures of the night and music coming alive. Two legendary superheroes leading a horde of insane titans, set on a path to blow your minds to bits. Heed the words of caution as this is not for the faint-hearted. Rumors, they are certainly not. The Wicked Festival 2013 is here. 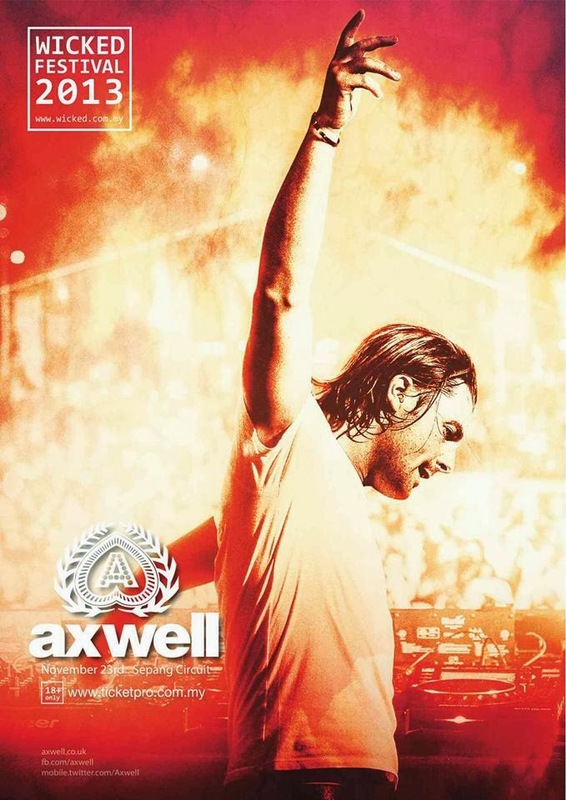 Axwell, the King from Swedish House Mafia pilots the crew. Who else but him can lead such a Wicked Festival? Who else is going to save the world tonight? Well, Zedd is. For the very first time in East Asia, this young prodigy will hit our stage and shed us some clarity. The magnitude of talents will melt your brains as No_ID from Amsterdam takes the stage along with DJ Nikki, BATE, Hightech, Ramsey Westwood and Captain Ed. The punches will come, blow after blow, one after another, all in a single night. Again, this is not for the faint-hearted. Where else can something so wicked be, if not at the Sepang International Circuit. Our very own pride and joy, world famous and well loved. When we say “ours”, we mean Malaysians of course. The Belgians have Tomorrowland, the Americans have Electric Daisy Carnival/Ultra Music Festival and the Australians have Future Music Festival. 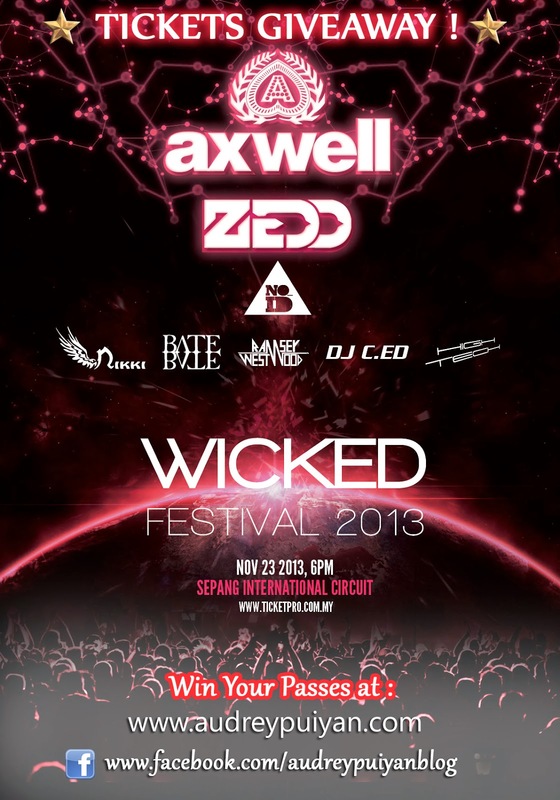 We, have Wicked Festival: 100% Original, 100% Malaysian. The tickets are now ready for purchase for RM99 (Early Bird) RM129 (Presale) RM169 (Door) and RM259 (VIP). Available at www.ticketpro.com.my, Rock Corner & Victoria Music Centre at all major shopping malls and Muscle Mania outlets. So mark your calendars as the year draws to an end. November 23, Sepang International Circuit, www.wicked.com.my. The Swedish House Mafia was first heard in 2007, in the Main Room at Cream Amnesia. Comprising of himself, Sebastian Ingrosso and Steve Angello, the enigmatic trio decided to put their talents together to give birth to music that would stun the world and revolutionize the entire EDM industry. To say it was a moment of epic proportions will be an understatement. His name was soon whispered in all clubs and festivals. Very quickly after, it was chanted by hordes in the millions, echoing from all corners of the world. Today, he is arguably one of the best EDM artiste in the world. He is none other than Axwell. And he is coming to Malaysia. No one else is more fit to lead the first ever Wicked Festival. Born out of calls for a true Malaysian EDM festival, one that we can call our own, Wicked Entertainment proudly presents Axwell, Zedd and other mind blowing talents to lead you through an incredible journey. In 2009, Skrillex discovered a young prodigy whose music embodies the evolution in Electronic Dance Music and signed him into his label, OWSLA. Along the way the young prodigy has produced tracks for the likes of Lady Gaga, Black Eyed Peas, P. Diddy, Swedish House Mafia, Skrillex, and was also awarded Billboard #1 dance track of 2012. Today, his performance mesmerize millions in mega festivals like Tomorrowland, Stereosonic, Lollapalooza, Ultra and many more. His name is Zedd. And he is coming to Malaysia. Heeding the calls of thousands who long to witness this prodigy for the first time ever in East Asia, Wicked Entertainment proudly unveils Zedd as the first Star of the Wicked Festival 2013. Two super EDM artistes leading a horde of mind blowing talents, Wicked Festival is all about the journey and the experience. 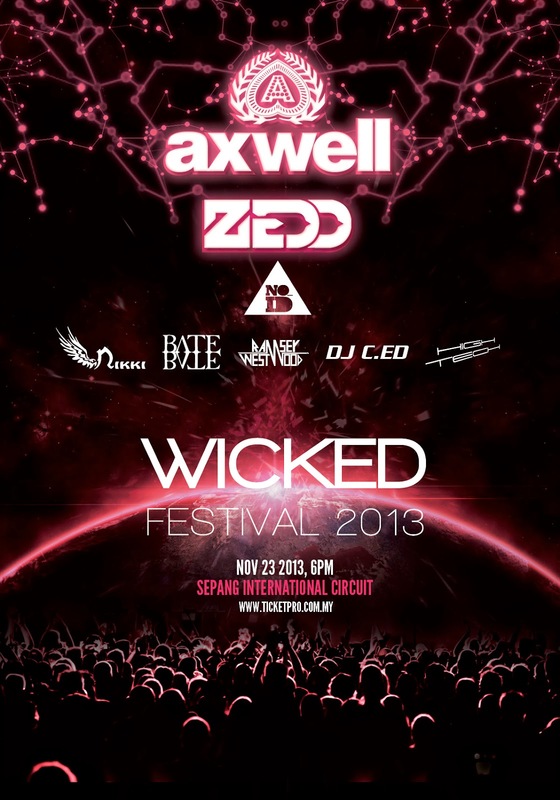 The last true music festival of the year: November 23rd, Sepang International Circuit, www.wicked.com.my. I guess you all know the videos below , the tracks are playing everywhere , in the radio , in the pub , club and etc . Therefore , you don't wanna miss this great party with me & the rest ! Besides that , I'm also giving away passes , you may try your luck ! Who know's you will be the lucky one joining the party with me ? Step 3 : Comment on this photo : "I want to go to Wicked Festival with ( tag one of your friend that your want to go with ) because ............"
Winner : The comment on the photo with the MOST LIKES ! Step 3 : Comment on this photo : "I want to go to Wicked Festival because ............"
2 X Winners : The MOST CREATIVE comment ! Hennessy Artistry HALO 2013 coming SOON ! Soju Kuala Lumpur is OPENING SOON !